Here are some insights (in italics) from the NACD report that are applicable to nonprofit succession planning, be it management talent overview or implementing the replacement process. The process …for succession planning should begin with determining the… organization’s future strategy. This type of generative strategic thinking is difficult to accomplish in the nonprofit environment for several reasons. 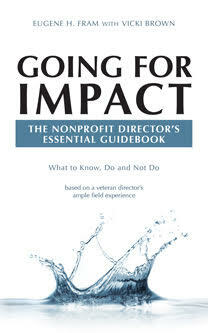 Currently, the planning cycle for most nonprofit boards that I have encountered is from three to five years. The median tenure for nonprofit board members is from four to six years. This means that most board members will only be actively involved with one planning cycle. My observation is that it not a motivating environment for longer terms nonprofit planning. It tends to focus planning on known details instead of the more ambiguous “what if” questions. At a minimum each cycle should have some considerations of the talents and skills that will be needed by senior managers to robustly complete the plan and to remains current for the next change. Such a listing allows senior managers to plan for personal growth and for board governance committees to better understand the new skills and talents required for board members. Examples: A CEO may recognize that she/h needs further background in the applications of Artificial Intelligence to nonprofits. In turn, the board has as an obligation to help the CEO to achieve this goal, even if the CEO might leave after taking advantage of this educational opportunity. From the board respective, the governance committee may decide that the board does not have a sufficient number of board members interested in fundraising to mount a capital campaign. The plan should how greater attention is needed to recruit candidates with comfort in fundraising. Trying to achieve agreement on projection can cause disruptive discussions among board members. Legacy-focused board members may try to sidetrack projections especially when the organization has been reasonably successful under a popular leader. But the airing of the issues can be helpful, even if they become emotionally charged. …Boards of directors are increasingly accepting culture as a hard issue, as opposed to a soft issue. that is measurable and has a direct impact on the organization’s performance. In both the for-profit and nonprofit environments, the CEO must drive the organization’s culture through example and operational policy. In turn, the board must trust and verify that the CEO is managing in a morally sound and ethical manner. Where questions arise related to the CEO, on these two issues, the board must start investigation, often with the assistance of an outside party. Have a healthy review of the nonprofit’s culture included in each planning cycle. Be certain that the CEO has a strong cadre of managers capable of growing in their current positions and able to advance if the opportunity arises. Become reasonably well acquainted with the strengths and limitations of key members in the cadre group. Allow three or more years to plan a CEO transition. Have a written plan in place in the even that the CEO becomes temporarily or permanently incapacitated. Nonprofit planning cycles, like those in the for-profit world, rarely relate succession considerations to the planning efforts because of boards have a constant churn of memberships. This tends to produce a short-term atmosphere not conducive to succession planning. Every planning cycle should include a review of culture as well as the growth and grooming of high potential staff. ← Nonprofit Policy Development & Operations Management – Crossing Boundaries? Great points, as always, Dr Fram! Succession planning should rank up there with strategic planning as two of the most important issues that Boards address. Unfortunately, personnel issues tend to slide when more pressing concerns arise. I recommend to my clients to include succession metrics for the ED, Board Chair and key committee Chairs in the annual Board assessment process. Yes, that requires them to have an annual Board assessment process, but that is an issue for another day. Michael. Thanks for adding to the discussion.